Cosmic is always a source of lights and movement. 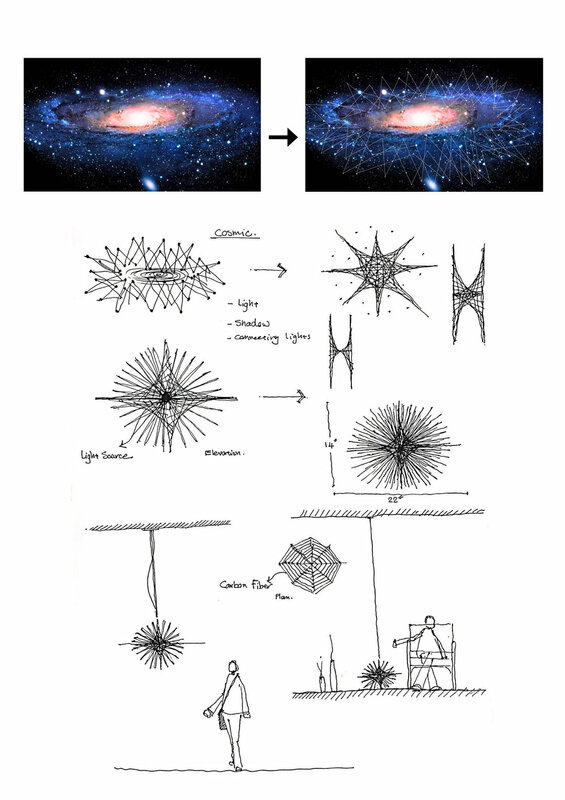 Central light is the source of everything and also there is a hidden geometry in the cosmic, which could be found by investigating the connection among light sources. 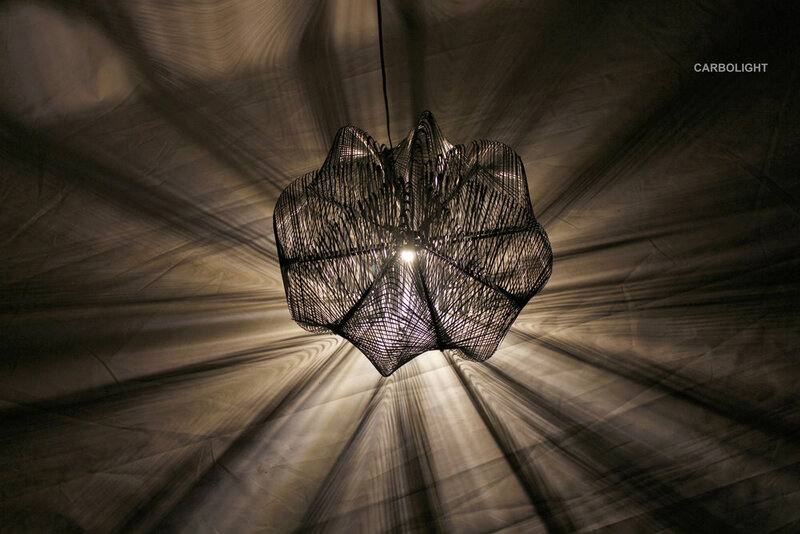 By the theme cosmic, Carbolight has been designed to draw the concept of light, geometry, and shadows. The fixtures are three-dimensionally balanced by carbon fiber strands that connect two points with a straight line by grouping and overlapping of multiple points and lines. Carbolight implies both simplicity and complexity. Simplicity arises from basic connections that allow the strands to span between two points. Complexity is embodied in the resulting compound curvature. The light fixtures are suspended centerpiece pendants with sculptural linear strands through which light casts dramatically and gently to illuminate the environment. The combination of these linear elements and center-mounted light creates spectacular shadows on surrounding surfaces. The project could be built with carbon fiber filament pre-impregnated with epoxy resin to stay malleable and sticky until baked. In this case, cardboard was used as the mold because removing it from the object is easy by cutting it or dissolving in water. The carbon fiber was wrapped around these edges in a predefined pattern to create a fluid shape with straight lines. I am student at North Carolina State University in the USA. I am planning to finish my Master of Architecture degree in 2017. I also have Master of landscape degree and bachelor’s degree in architecture. I love to design furniture and lighting fixtures as well, and my philosophy is complexity and simplicity at the same time. Exploring new material and fabrication process is my research interest, and I’ve done couple researches in this area. "...we're all made of stars.."
..Our goal was to innovate the usage of light by separating the light source from the illuminator. Utilizing rare earth magnets, we designed a levitating cap that is easily rotated to alter the brightness and direction of the light source: the underside of the floating cap, is half gloss and half textured white, altering the light reflection depending on position. A balance between a warm, natural smooth concrete with the bottom dipped in a mid-gloss lacquer finish, were used in the construction, creating an industrial, yet contemporary design, without the use of any toxic materials. The floating top cap, with it's textured concrete top, illuminated by the levitating white underside, plays on the paradoxical notion of the floating, shaped rock, seemingly lifted by the light emanating below. The Béton is foam, cored for the electrical components and encapsulated in a concrete skin. The floating cap is made in the same manner. Once cured, both parts are drilled and the rare earth magnets are installed symmetrically, to align and create the desired repulsion. The fixture is 14"x14" at the base and 5'-0" tall. George Foussias, a co-founder of the art collaborative räh leveraging his experience in product, lighting, furniture and equipment design and brings a sense of vision and execution to this collaborative's innovative environment. Peter Rattan is the co-founder of räh and brings a wealth of experience in Marketing and Branding. Creatively, Art and photography are passions of Peter's, expertly merging these two mediums to create practical applications within the design realm. A popular depiction of a black hole is an unseen force of nature drawing light down to a single point in space. Using this analogy, the ‘Black Hole Lamp’ controls the intensity of the light being emitted by creating a funnel from which the light cannot escape. In the ‘on’ position the reflective disc of material is fully illuminated, but as the flexible disc is drawn back towards the center of the black hole, the light gets dimmer until it eventually disappears. The ‘Black Hole Lamp’ is effectively dimming the light as it changes shape, in the same way a black hole draws in light and matter by altering the fabric of space. The design of the lamp features a silicone disc which is deformed by pulling it (angle and length are changed), decreasing the travel of the light rays and its area of contact. Dimensions: Height: 1400mm Base width: 600mm Base length: 500mm Shade diameter: 500mm Materials: Stainless Steel rod ½” – 3/8”, Silicone disc, Stainless steel frame, Rings of LED’s. Manufacturing Processes: Metal tube bending, Welding, Stretched silicone sheet, Metal cutting, Metal brake forming. Designers: Dario Narvaez: Senior Industrial Designer. His work ranges in the field of consumer products, automotive design, and digital painting. Clients such Colgate, John Deere, Panasonic, Harley Davidson, OXO are featured in his portfolio. Tony Baxter: Curve ID Partner and director of diverse projects for well known clients including Nike, John Deere and Colgate. Tony has been awarded internationally recognized design awards including an Industrial Designers Society of America.